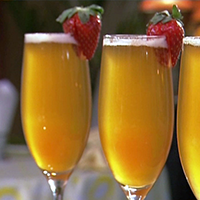 Fill champagne Flûte with Cointreau, Cherry Brandy and a splash of Pineapple Juice. Top with Champagne. Add Strawberry for garnish.